We’d love your help. Let us know what’s wrong with this preview of Doctor Who by Jonathan Blum. Sam is homeless on the streets of the colony world of Ha'olam, trying to face what's just happened between her and the Doctor. He's searching for her, and for answers. While she struggles to survive in a strange city centuries from home, the Doctor comes across evidence of alien involvement in the local mega-corporation, He has no idea why Samantha Jones ran away from him. Sam is homeless on the streets of the colony world of Ha'olam, trying to face what's just happened between her and the Doctor. He's searching for her, and for answers. While she struggles to survive in a strange city centuries from home, the Doctor comes across evidence of alien involvement in the local mega-corporation, INC - and is soon confined to a prison that becomes a hell of his own making. Where did INC's mysterious eye implants really come from? What is the company searching for in the deserts? What is hiding in the shadows? Watching their progress? 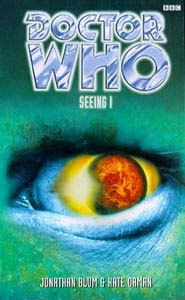 Seeing I continues the 'Sam is missing arc' that spreads over 4 novels in the Eighth Doctor Adventures. The story starts with her looking for work and trying to settle down, whilst in the other chapters we follow The Doctor's attempts to find her. I'd taken a bit of a break from reading the EDA's, some of the previous titles had become a bit of a chore. But this satisfying story conclusion has rejuvenated my enjoyment of the range. Both Sam and The Doctor's characters were well developed here, I go Seeing I continues the 'Sam is missing arc' that spreads over 4 novels in the Eighth Doctor Adventures. Both Sam and The Doctor's characters were well developed here, I got a really sense of McGann's voice whilst reading this installment. My feelings about this book are, approximately, "OMG OMG OMG OMG!!" * JEWS IN SPACE. The planet's called Ha'Olam, and I liked that when it was name-dropped in Dreamstone Moon. But lo, Sam's room My feelings about this book are, approximately, "OMG OMG OMG OMG!!" * JEWS IN SPACE. The planet's called Ha'Olam, and I liked that when it was name-dropped in Dreamstone Moon. But lo, Sam's roommate is Shoshana! Sam joins up with an activist group called Tikkun Olam!! Everyone uses Yiddish slang!!! One of the chapter titles is the godawful pun "Oy Gestalt"!!!! * SAM DATES A WOMAN. Although the woman's name is Chris and you only know she's a woman if you, like me, noticed that in her only other cameo she was using a power drill and thought "ooh, I bet she's hot" and are thus equipped to make the purposely obscure connection much later in the book when there's a one-sentence flashback about Sam and Chris dating for years before Chris ran off with someone else. ...And it's bookended by Sam's relationships with two men, which are major parts of the story and last for whole chapters each.... So honestly, I have very mixed feelings about all of this, and I'm really sad that extremely coded references like Chris and "Free the Kinsey Three" are the only things Blum thought he could sneak into the novel, but I'm also completely jazzed that Sam is confirmed as bi. Such is queer life! The best of the eighth Doctor novels so far. Although I was at first tempted to continue skimming through Sam's story, I quickly was captivated by it. Sam grows up in this one (finally). I think I actually find her tolerable now. The Doctor's character journey was both thrilling and terrifying. A future re-read for me. If you love the Doctor, read it. The BBC Books imprint of the Doctor who Books focuses on longer books, a bit more adult than the Tv adaptations, and like any series of books, some are better than others. The especially interesting thing about this book is the psychological stress on the Doctor in this situation. The Doctor usually wins and wins quickly--here he is imprisoned and really struggling to keep his mental "balance". I won't spoil it further with details. It is one of the best Dr. Who Novel's I have read and I've read The BBC Books imprint of the Doctor who Books focuses on longer books, a bit more adult than the Tv adaptations, and like any series of books, some are better than others. The especially interesting thing about this book is the psychological stress on the Doctor in this situation. The Doctor usually wins and wins quickly--here he is imprisoned and really struggling to keep his mental "balance". I won't spoil it further with details. It is one of the best Dr. Who Novel's I have read and I've read a lot. One particularly gripping scene is the Doctor's reaction after a failed escape attempt. Another prisoner , who joined in the Doctor's escape plan is killed, and the Doctor has a hard time dealing with it. One of the most intense books of the early 8th Doctor canon...and one that completely and totally deconstructs the Doctor by stripping him of everything he is, everything he can do, and everything he THINKS he can anticipate. One of Kate Orman's (and Jon Blum's) greatest contributions to the Doctor Who canon. Absolutely wrenching. My top favourite Doctor Who novel so far. Another novel where Sam and Eight spend most of their time apart, but this time I was drawn into both their plots so deeply that it almost didn't matter--though I was so relieved at the final rescue. (view spoiler)[The Doctor is the one who needs rescue in this one. He starts out trying to find and save Sam, who's trying to fit in on a new planet after they were separated several books back. But while hacking the network of the plan Absolutely wrenching. My top favourite Doctor Who novel so far. Another novel where Sam and Eight spend most of their time apart, but this time I was drawn into both their plots so deeply that it almost didn't matter--though I was so relieved at the final rescue. (view spoiler)[The Doctor is the one who needs rescue in this one. He starts out trying to find and save Sam, who's trying to fit in on a new planet after they were separated several books back. But while hacking the network of the planet's uber-corporation, he's arrested, and all his attempts to escape come to nothing. There's a slowly creeping horror as he and the reader realize that he really truly cannot escape this time. For three years (THREE YEARS), Eight is trapped inside a very nice but very secure prison complex, going slowly mad with frustration and the loss of his TARDIS. Meanwhile, Sam Jones makes her way up from the soup kitchen she lands at, gives being a good little office drone a shot...and then chucks it all to go live and work on an eco-farm with a community of idealists. It's a very Sam Jones thing to do. She grows up a lot; the three years she spends there span age 17 to 21 for her. She has several romantic relationships, including one with a woman (Chris, whose gender is a blink-and-miss-it mention, but whose relationship is explicitly a romantic one of so long that people "had spent so long thinking of [Sam] as one half of Sam and Chris that they couldn’t picture her in any other way") and with a man named Paul (ha!) who reminds her of the Doctor. There are also some great quotes about her crush on the Doctor and how she's working her way through that. And then she discovers what's happened to the Doctor, and works out how to save him. Her years on her adopted planet of Ha'olam have given her contacts and local knowledge which she uses in a jailbreak that finally, finally frees the Doctor from his prison. The scene where Eight is at last reunited with his TARDIS after three years of incarceration, where he stumbles off down the corridor and sobs brokenly because he really had given up hope, is absolutely brutal. "Three years of nothing," he says to Sam. But the story doesn't leave him there; this is a solid entry in the genre of hurt/comfort (thank you, Kate Orman! ), and the Doctor (with the help of Sam, the butterfly room, and time) starts to patch himself together again. And in a scene that to me hits all the notes of resilience and optimism that Doctor Who is known for, Sam finds out that the Doctor (who lost his old costume while he was a captive) has gone and replaced his costume from the movie--but this verson has been made by a real tailor, from durable materials that can be worn for real, not just a cheap party costume. The Doctor is back, real and solid and ready to face the future. I thought this was a rather good Eighth Doctor novel, with the Doctor and Sam finally reuniting after three years in which Sam becomes an environmental activist and basically grows up, while the Doctor is held in a very creepy and nasty prison. I was one of many Old Who fans who took a while to get used to the romance element between the companions and the Doctor in New Who, but here is an example of it being worked rather well into the narrative. This Arc, where Sam is stuck on this planet for YEARS, is my fave of the 8th doctor adventures so far. Finally, a series that isn't afraid to write consequences into their stories. A lot to love here. The failed domestication of Sam. A prison that actually can hold the Doctor. A really good, solidly paranoid story. And an ending that gets quite cerebral. Loved it. The Doctor is still looking for Sam. Meanwhile, Sam is finally getting a normal life on an alien planet. Think about one of the worse things that could happen to the Doctor, being restricted to one room forever. This is a very clever story and the author really puts the characters through the ringer. It is quite emotional to see the Doctor so vulnerable, and you feel for him. I'm not sure that this would be a good starting point to the 8th Doctor books though. A very good read. Absolutely wonderful. I enjoyed every single moment of this book. Especially nice was the unexpected connection to the later novel "The Infinity Doctors" (Past Doctor Adventures series), which draws heavily on this story. Sam's character development is brilliant and if she hadn't already been one of my favourite companions, she'd be listed among them after this. Very enjoyable book overall. I liked the first two thirds more than the conclusion however. Not a classy c, but a capable and entertaining story. Grand on s ale, but at times not as engaging as it could have been. Jonathan Blum is the author of several Doctor Who novels and Big Finish audios. He currently lives in Australia with his wife Kate Orman.